The Analog Rytm combines analogue drum synthesis with sample playback. Is it the ultimate beatbox? 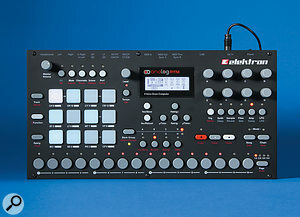 A new drum machine from Elektron is an exciting prospect, made even more so by the current policy of 'analogue with everything'. After all, their previous percussive powerhouse, the Machinedrum, is widely regarded as a digital classic and now, borrowing extensively from the Analog Four and Keys, Elektron have unleashed the Analog Rytm, a pumped-up hybrid drum machine awash with ambition and flashing lights. Quite why the cool Swedes dropped their aitches in the naming ceremony is not made clear, but there's no mystery in the appeal of pad-based drum sequencing, coupled with analogue-voiced percussion and samples — especially when effects, individual outputs and a substantial storage capacity are part of the package. Physically, the Analog Rytm is a black metal box in the Octatrack/Analog Four mould. In other words, it's built to last. Vividly proclaiming its percussive identity, the Rytm is fitted with 12 rubber pads, rather than the more commonly seen 16. They're velocity and aftertouch sensitive and spaced for finger drumming, but are much smaller than those of an Akai MPC or DSI Tempest. If you're right-handed, they also feel like they're on the wrong side. However, even the smugly ambidextrous could struggle to achieve much expression. My own strikes varied between very low values and the maximum, with precious little subtlety in between, and there's no way to adjust the sensitivity. The pads transmit polyphonic aftertouch, but the response is stiff and has little 'give', which is all a bit sucky on a flagship machine. It's a pity because both pressure and velocity are valuable modulation sources in every drum voice, each able to control as many as five parameters. The pads light up in a variety of pleasing hues to convey track selection and the current mode, but colour isn't so integral to operations as on, for example, Native Instruments' Maschine, and no user assignment of colour is possible within a kit. The operating system is mostly fast and logical, at least if you're familiar with Elektron's slant on user interfaces and multi-functionality. The majority of sonic tweaking is spread across six directly accessible pages, but several edit functions must be hunted down in the 'Sound' menu. Your window on the Rytm's interior is the 122 x 32 pixel display with its blocky graphics, which is adequate without ever being luxurious. The buttons and encoders are of the usual high quality and it's your choice whether the encoders send MIDI CCs or NRPNs. Despite its external power supply, the Rytm is a hefty 2.4kg and runs quite warm; although not as warm as the toasty Analog Four module. In further commonality with the Analog Four, there are three MIDI ports. Should their regular functions not be required, the MIDI Out and Thru sockets may be configured for DIN Sync, in either 24 or 48 PPQN varieties. No fewer than eight individual outputs, available via TRS jacks, join the regular stereo pair, a decision that saves precious space. For the price of an insert cable, you get two outputs occupying the real estate of a single socket. A stereo input is provided too, the signal hitting the audio chain just before the compressor. If it has any controls I failed to find them, nor is there an overload indicator. Finally, the USB port is another source of regular MIDI and is useful for operating system updates, something I attended to at once. In the future, USB will act as the gateway to Overbridge, Elektron's take on 'Total Integration', expected later in the year as a free add-on to all 'Analog' products. The 1GB internal +Drive is an excellent repository for your favourite samples. In addition it can hold a library of 4096 drum sounds and 128 projects, each with 128 kits and 128 patterns. If these numbers have a familiar ring, that's because so much is consistent with the Analog Four and Analog Keys, although a glance will show the buttons have been shifted around to accommodate the pads. Having recently succumbed to the pleasures of the Analog Four myself, I had to quickly retrain my muscle memory to the layout of the Rytm. The saving of patterns, kits and individual sounds all have equivalent key combinations, but copy and paste operations (Func + Transport keys) now require two hands. It's swings and roundabouts, though, because, by placing the Pattern Bank buttons centrally, any pattern is now easily within one-handed reach. There are 12 available drums arranged into tracks: BD, SD, RS, CP, BT, LT, MT, HT, CH, OH, CY and CB. If you've had even a passing acquaintance with drum machines, those abbreviations will be instantly recognisable. Each track's analogue synthesis circuitry has been assembled specifically for percussion; some tracks have two oscillators while others have as many as six (to cover the complex needs of cymbals and hi-hats). Collectively these are known as 'machines'. However many oscillators are involved, digital assistance is supplied in the form of noise and modulation sources. Unsurprisingly, the most important tracks have the most involved sound sculpting and more choices of machine. Some would benefit from alternatives, not least the cowbell, which is as ghastly as tradition demands. Claves would be a welcome replacement, or güiro perhaps. For now, such exotic ground must be covered by samples, and one accompanies every analogue machine. Machine and sample are mixed, the results optionally overdriven and processed by a multimode filter. The journey ends with beefy analogue distortion and compression, ensuring the Rytm need never be ignored. However, before following the audio stream to the end, let's pause at the source. Up to eight tracks can sound simultaneously. Of these, the bass and snare drums, plus bass and low toms, are completely independent. Amongst the rest, voices are paired up, their links illustrated on the panel with a dotted line. The right-most track takes priority in each case. Thus the clap will silence the rimshot, the open hi-hat overrides the closed, and the cowbell, inexplicably, takes precedence over the cymbal. At the rear of the Rytm we find a power switch and input for the external PSU, a USB port, MIDI Thru, Out and In ports and, on TRS sockets, eight outputs, an audio input, stereo outputs and a headphone out.I can think of no better way to make the Rytm's acquaintance than with a thumping analogue bass drum. There are currently three 'BD' machines: Classic, Hard and FM, and eight parameters each to tailor them. If you select the hard bass drum, the encoders adjust tuning, pitch sweep time, snap, decay, waveform, hold and tick level. Although abbreviated to three characters on the display, each function is fairly obvious but some warrant a quick mention. Of these, both snap and tick level contribute initial transients that help the kick cut through, adding definition you'll appreciate, especially when you select the smoothest waveform (sine). Hold is simply an extension period before the decay kicks in. It's useful for adding body to a drum voice before it hits the filter and amplifier stages (both of which have full ADSR envelopes of their own). I couldn't pick a favourite between the Classic and Hard bass drums; they're big, bold, deep and fabulous. The FM bass drum is the choice for freaky, off-the-wall noises; it employs one oscillator as an audio-level modulation source for the other. The first four tracks can all handle kicks and snares, but it's the second track that's the latter's natural home. There are three snare choices, again Hard, Classic and FM, and in total they offer a wide (but not exhaustive) range. With judicious tweaking they'll cough up a healthy assortment of 'noise & tone' hits, reminiscent of drum boxes of yore. The clap is great, but the toms are rather basic. Similarly, the closed and open hi-hat have only a few parameters to mash them up and the cymbal is pretty unremarkable. While some of the tones are limited, a dash of overdrive, filtering or fast modulation from the LFO can work wonders. Otherwise, you can route voices to individual outputs (on a per-kit basis) for external roughing-up. If you still can't nail that perfect hi-hat or cymbal, samples readily come to the rescue, either boosting, velocity-switching or replacing the analogue machines entirely. Nevertheless, it's to be hoped there are new machines in the pipeline to fully exploit the Rytm's analogue nature. Right now, there isn't a huge selection of factory sounds, and with so many free locations on the +Drive, the first priority will probably be to knuckle down and create more! When selecting a sound, either from the +Drive or from the pool available to the project, only those that can be played by the current track are visible. You can't trigger a cymbal sound on the snare track because it hasn't enough oscillators. This makes sense when you're relying on the analogue circuitry but it seems a bit daft when the track only uses samples. Each project has 64MB of sample RAM and slots to accommodate 127 samples. This might be fine for most purposes, given there are only 12 tracks per kit. But the slots, more so than the RAM, are easily consumed by the 128 kits a project can hold, and also by 'Sound Locks', the technique by which extra sounds are triggered on a pattern's every step. This feature is one of Elektron's coolest, although it comes with the same constraints as before: the track must be capable of playing the sound you're trying to select. You're presented with a flashing '!' in the sound list to warn you when a choice is doomed. Although it has a stereo input, the Rytm doesn't sample but relies instead on importing .WAVs. Sample playback is mono and 16-bit 48kHz, although other bit depths and rates are converted automatically on import. Since not all conversion processes are equal, audiophiles may wish to perform the conversions in advance. In practice I found everything I sent just worked. However, some patience is required. Samples are loaded via USB or the regular MIDI port and, as they're sent via MIDI Sample Dump Standard (SDS) and Extended SDS, you'd be pretty masochistic to pick the slower five-pin option. Elektron's readily available 'C6' program is the recommended method of sample transmission and it's important to read the documentation thoroughly or risk overlooking the 'turbo' box and the method for transmitting sample names. Even so, I doubt you'll fill the whole 1GB in one sitting. It took approximately 20 minutes to transmit just 36MB, but as the Rytm has no card slot, this is currently the fastest method available. Incorporating not just ethnic percussion, but samples of every description is a superb way to extend any kit; you needn't be limited to the occasional bass line or illicit slice of movie dialogue! Via a MIDI keyboard, or by engaging the Rytm's Chromatic mode, you can play back and record (monophonically) exactly as you would from a regular sample player, each track on its own MIDI channel. Generally, using the Rytm this way has a lot going for it, not least the fact that samples are processed by Elektron's analogue filter. Yet despite the many pluses, there's no handling of loops and slices, nor is time-stretching implemented or under consideration. You can reduce a sample's bit-rate and transpose it by plus-or-minus two octaves. The sample's start and end points are readily parameter-locked or fluidly modulated using an LFO, velocity or aftertouch. If you set a sample's start point beyond the end, it plays backwards and there's a simple switch to keep it looping if necessary. Otherwise, as befits percussion, all samples are 'one-shot'. Each voice is equipped with a 12dB multimode filter, switchable between low-pass, band-pass, high-pass, band-stop and peaking modes. Several one-pole variations are included too, the 6dB slope ideal for general EQ duties. Overall, it's a good filter, bright and lively sounding in all modes and sporting a resonance that spits out everything from Kraftwerkian blips and zaps to deep, resonant kicks. To keep you on your toes, overdrive is located on the Amp page, despite being internally positioned before the filter. Too much overdrive can reduce a signal to charcoal and its effect on, say, bit-rate-reduced samples can be frightening at the extremes — until the filter takes the edge off anyway. Rounding off each track is a single LFO with one modulation destination. Those offered include the voice parameters of the analogue machine and sample, plus those of the VCF and VCA. Having an LFO at all is brilliant by drum machine standards, if slightly stingy by Elektron's. The sequencer closely matches that of the Analog Four/Keys so I won't cover too much old ground here. It supports step-based input via 'grid mode', or real-time performance capture from the pads and encoders. The resolution is a healthy 1/384th of a note, but if your preference is for old-school drumbox 16ths, you can automatically quantise as you go. Actually, I should have said most of a performance is captured because the pads' aftertouch is not recorded, nor are performances involving note retriggering (repeats). Currently, 'retrigs' must be added per-step in grid mode. 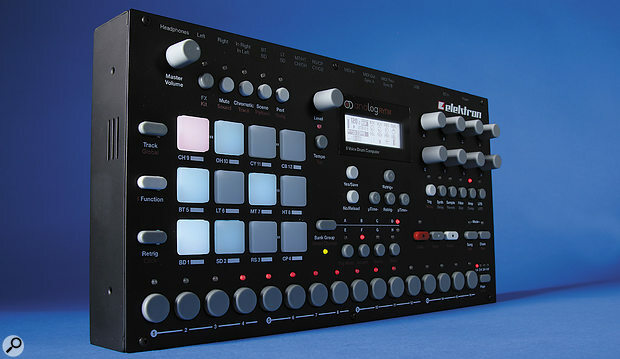 The Analog Rytm's front-panel design is very much in keeping with Elektron's other instruments.There are eight banks (A-H) of 16 patterns, each up to 64-steps long. A pattern consists of the 12 drum tracks, plus the 'effects' track, and all tracks run at the same speed. In 'Advanced' mode, tracks can be assigned unique lengths, which is essential for devotees of percussive polyrhythms. Longer, more complex patterns can be assembled by using the chain function to temporarily string them together. Conveniently, each chain you make is stored internally, ready to assemble into a song later. As usual, you're left to fend for yourself when it comes to tempo; there's no means of storing it per pattern, bank or song. On a brighter note, a recent OS update removed one minor irritation: undo — very handy after those accidental clear or paste operations — now works when externally sync'ed. Scenes and Performances are temporary parameter overrides set up for pre-determined tweaks. These concepts were well worth recycling from the Octatrack and Analog Four and are of enormous benefit since the hardware is so reliant on multi-functionality. A dozen Scenes and Performances can be programmed per kit and triggered from the drum pads. The main difference between the two is that Scenes offer instant on/off changes to parameters, while Performances employ aftertouch for gradual variations. In both cases, up to 48 track parameters can be modified, this number divided any way you please amongst the pads. Exclusively for Scenes, the selection can remain active when you leave the Scene page, and as a visual reminder, the LED remains half lit. Since Performances depend on pressure, the kit returns to its previous values as soon as you let go. It's a pity the pads don't push down very far but, even so, aftertouch beats velocity response for generating a wider and more predictable spread of values. It's also a good finger workout. Most voice and effect parameters can be dynamically manipulated and, to offer a couple of simple examples, you could swap all the samples in your current kit by hitting one pad, then send all instruments through the delay using another. Alternatively, you could pitch-bend the toms with one finger, whilst another opens the snare's filter and simultaneously extends the reverb's decay time. For further live interaction, the muting and soloing of tracks happens in Mute Mode. First, you press then release the mute button. All the pads turn green and if you touch any of them, the corresponding track is muted. In this mode, the Retrig button plus a pad (or pads) becomes a solo function. While I might personally prefer a more direct mute and solo process, my main complaint is that mutes apply universally. Given the Rytm holds 128 different patterns, it's very limiting that you can't store the mute status of tracks in each. The wealth of patterns is useful in other ways, not all of them obvious. Unlike certain classic drum machines, the Analog Rytm doesn't have fill-ins. But with a little advance planning you could create a suitable pattern in every bank ready for when you'd like a fill. The three 'Direct Change' modes also play their part; they govern how each pattern change occurs. You can swap patterns mid-way through, or wait until the current pattern ends, or you can jump directly but forcing the new pattern to restart. It's even possible to seamlessly copy patterns during playback, with the proviso that you must first switch to the 'pattern end' mode of Direct Change. Other functions have been quietly lifted from the Analog Four too, which means you can mute specific note triggers and parameter locks in advance, ready to reveal them during your live set. Accent is also present and so often easier than adjusting the velocities of individual steps. Slide enables smooth transitions between parameter values, such as the opening of a filter or the sweeping of pitch. This leaves only 'Retrig', which I've mentioned already. This is a mechanism for retriggering a sound (or sounds) at a variable rate — a rate that peaks at a frantic 1/80th of a note! Unusually, for Elektron, the rate is shown as a musically meaningful value rather than an obscure number. By applying pressure, retrigger velocity is increased, temporarily overriding regular aftertouch functionality. In other handy applications, picking a Retrig value of 1/12 offers an instant way to add triplets — not typically so easy to toss in. The dedicated effects track supplies delay, reverb, analogue distortion and analogue compression. Given it, too, has an LFO and supports parameter locks in the sequencer, the results can be remarkably intricate. Reverb and delay are available to every track as send effects. Thanks to 'infinite' decay and its frequency-specific damping, the reverb exhibits the same epic qualities as the Analog Four's, while the delay is comparable too, having an aggressive feedback and filtering of the delayed signal. For extra analogue warmth, the distortion is like a friendly tramp — dirty but engaging. It, plus the analogue compressor, are capable of extreme volume boosts and one of the biggest challenges I encountered was setting an even and consistent level for all kits. It occurred to me that, of all the components you might wish to set globally, the compressor would be one of the better candidates. It lacks only a noise gate to be completely effective, but its side-chain includes basic frequency selection so you can choose which parts of the signal the compressor reacts to. The Analog Rytm is an intelligent blend of analogue drum synthesis and sample playback, even if it doesn't yet feel mature. The first version I tried had several rough edges, but the updates are coming thick and fast, and even before I'd finished writing some issues had been resolved. Nevertheless, if this is to be the ultimate percussion sequencer, there are a few wonky operational choices, such as the global nature of mutes and tempo. However, my greatest misgivings concern the drum pads themselves. They would have been unimpressive on a limited budget, so seem particularly poor in this price bracket. 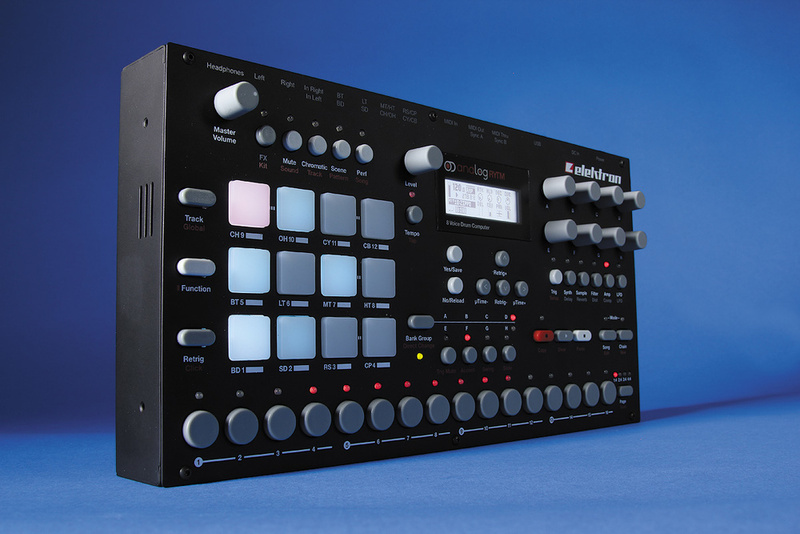 Previous exposure to Elektron gear generates fairly high sonic expectations, and though the kicks and snares are very good, the other analogue machines are somewhat lacking in adventure. Samples make a huge contribution and it's when the hybrid voice is processed by the analogue filter, distortion and compressor that the Rytm really shines. Being greedy, I'd have liked more than the 127 sample slots, especially since there's enough RAM for a vast number of complex, extended drum kits. The +Drive offers ample storage for samples, sounds, kits, patterns and projects and I didn't even mind that sample import was so ponderous. I did think it a shame there was no provision for stereo samples, drum loops or time-stretching though. Ultimately, pairing analogue voicing with sample playback is a simple but superb idea and, if the Analog Rytm doesn't yet feel complete, it has plenty of room to grow. 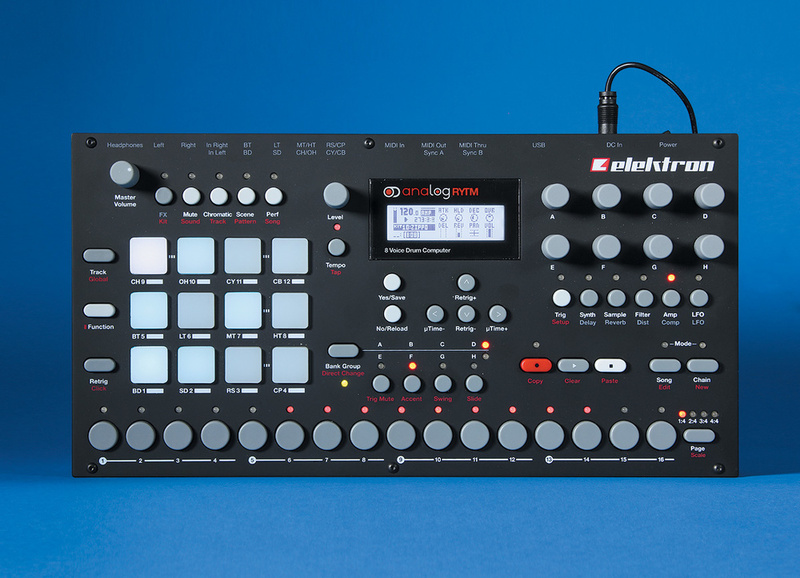 Elektron have a solid track record for updates and the forthcoming Overbridge technology could yet prove to be a game-changer, slipping the 'Analog' products into your DAW. Even if you're committedly hardware-only, the Analog Rytm has a lot to offer and its tried-and-tested sequencer, plus the 'prepared spontaneity' of Scenes and Performances could mean it's the only drum machine you'll ever need. DSI's Tempest also has sample playback and a synthesis applicable to drums or polyphonic synth duties. Its pads are superior and its strengths are therefore in performance and its synthesis depth. The Tempest lacks the effects, sample import and massive capacity of the Rytm, though. A closer alternative could involve the purchase of two drum machines. For knobby analogue drums, the MFB Tanzbär kicks like a mule and Korg's ancient ESX1 is still the most flexible and welcoming sampling drum machine in the known universe. You can save mutes independently per pattern and the fact it only has 24MB of sample RAM and no USB is offset by its handling of loops and stereo samples. Analogue drum synthesis and sample playback in one machine. Scenes and Performances offer radical planned changes on the fly. Parameter locks and Sound locks provide powerful per-step programming. ...and 64MB of RAM isn't bad either! Features a well-chosen blend of analogue and digital effects. The pads are a disappointment in size and responsiveness. Samples are mono only and there's no provision for loop handling, slicing or time-stretching. Not enough variety in some analogue voices. Mutes are global rather than per-pattern. The Analog Rytm is an excellent-sounding hybrid drum machine that combines percussion-focused analogue circuitry and sample playback. The pads won't blow you away, but otherwise it's full of sequencing potential.